Arjun Kapoor, Malaika Arora party with Kareena Kapoor Khan. Read all latest Bollywood stories and updates of October 29. Having Monday blues? We know there is is no way to escape it but you will definitely feel better after reading all the trending Bollywood news and updates. Well, this is because today we got to you some inside pictures. 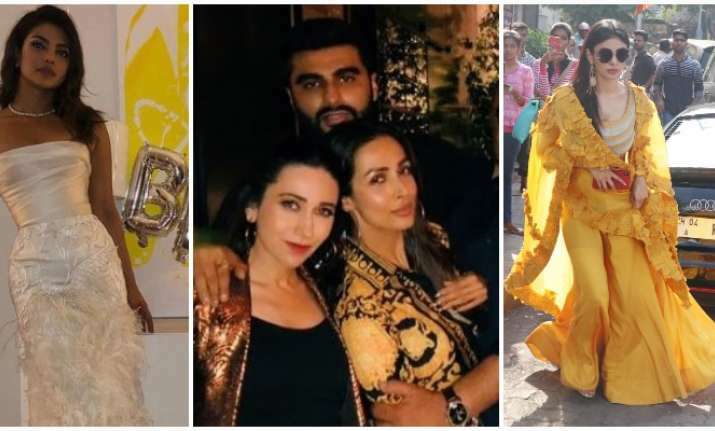 From hot couple of the town- Malaika, Arjun's party to Priyanka Chopra's bridal shower celebration, get a glimpse of the inside world of celebs. So, while you sip your cup of coffee or commute to work, have a look at all the trending Bollywood news. Happy scrolling. Bollywood’s latest lovebirds Arjun Kapoor and Malaika Arora, who have been making headlines with their frequent appearances together, were spotted partying the night off on Sunday. It has come to everyone’s notice that the couple is not doing anything to hide their relationship status from public anymore. On Malaika’s birthday, Arjun Kapoor accompanied her to Italy and the duo celebrated her birthday together. On airport, they were seen walking together hand-in-hand and they made no bones about it. Recently, Arjun Kapoor and Malaika Arora partied together at her sister Amrita Arora’s. Close friends Kareena Kapoor Khan, Karisma Kapoor and Natasha Poonawalla were also present. The event was Malaika’s birthday bash which was due from October 23rd. However, the actress was busy shooting for her reality show India’s Got Talent and India’s Next Top Model. Full story here. Priyanka Chopra and Nick Jonas are hitting headlines more often now and why not, only a month is left for their wedding. If you are among those who are excited for Priyanka and Nick's wedding, then let us inform you, their pre-wedding celebration has begun. Bridal shower for PeeCee was held by her bridesmaids in New York. The party was thrown by Mubina Rattonsey and Anjula Acharia with guests Kelly Ripa, Lupita Nyong'o and PeeCee's future sister-in-law Danielle Jonas and her daughter Alena. Priyanka sizzled in an off-white gown by Marchesa and she took to Instagram to share a picture of the celebration. Full story and all pictures here. Disha Patani and Tiger Shroff have been rumoured to be dating for a long time. Though the couple has never come out in open about their relationship status, but their frequent public appearance together was a telling proof of their love story. However, from past few days, the couple have been rumoured to call it splits and amid these break up rumours, the Bharat actress was spotted with her gym buddy Aleksandar Alex Ilic. In the picture, Disha Patani is flaunting her infectious smile to the paparazzi. Disha Patani was dressed in golden track pants and white crop t-shirt while Aleksandar Alex Ilic was spotted in white shorts and blue camouflage t-shirt. Full story here. Mouni Roy is one of the stylish actresses we have. The diva was recently spotted in a bright yellow dress. She attended MAMI brunch in yellow skirt which she paired with yellow and silver blouse which had wide, long ruffled sleeves. Meanwhile, actress Deepika Padukone was spotted at the airport in white long kurta and flared denim pants. Not to miss, she rounded off her look with sunglasses and a wide smile. Check out all pictures. Bollywood actress Konkona Sen Sharma, who will be playing a transsexual person in her latest short film A Monsoon Date believes that someone from the same community should have essayed her character. However, she is hopeful if stories such as these start coming out, they can encourage LGBTQ people to pursue acting as a career. Written by Gazal Dhaliwal, A Monsoon Date is directed by Tanuja Chandra and chronicles the story of a young woman who is about to reveal a heart-breaking truth about her past to the man she's dating. Click for full story. For Gajraj Rao, Badhaai Ho is no less than a miracle. After being in the industry for over two decades, it is Ayushmann Khurrana starrer that gave him due recognition and popularity. However, Rao not relies on just acting for financial security as he firmly believes that it is not a lucrative profession unless one is a superstar. ''It's a miracle, it's magic," says Gajraj, not talking about his Badhaai Ho character impregnating his wife at an age when couples cradle their grandchildren. Gajraj is dumbfounded by the success the film has got him. "The calls, the messages, friends and strangers alike are calling from all over the country and from outside. I never imagined this film would change my life and career. But it has. It is all destiny," said the actor, who has been around since 1998. Read full story.